None of the information in the following article is spurious or based on conjecture. It is based on hard evidence that has been determined through research, Freedom of Information (FoI) requests to Sheffield City Council (SCC), and information that already exists in the public domain. I have thrown down the gauntlet to SCC and Amey to prove me wrong on any single point – to date, they have not provided evidence to disprove any of them. Prior to any organisation being awarded a contract, it is imperative that a number of things are established first, one of which is the health and safety details relating to the prospective contractor. It is inevitable that all organisations, no matter how large or small, will have entries in their accident books; some may also have reported certain incidents to the relevant enforcement authority under the Reporting of Injuries, Diseases and Dangerous Occurrences Regulations (RIDDOR). This is not an automatic ‘deal breaker’ when it comes to the awarding of a contract but is certainly worthy of consideration. However, there are other greater considerations: namely the enforcement and prosecution records of the prospective contractor. This is where an enforcement body such as the Health & Safety Executive (HSE) might have issued an improvement notice or a prohibition notice – these must be complied with by the recipient. Prosecution is usually the last resort when there has been a failure to comply with an enforcement notice, or a more serious incident, such as a major injury or a workplace fatality, has occurred. This sort of information could have far greater bearing on any contract award decision (provided the contracting authority concerned has a robust and thorough due diligence process). Prior to bidding for the Streets Ahead contract, a workplace fatality occurred on an Amey highways contract. It is now known through a FoI request (that was initially declined by SCC but subsequently overturned by the Information Commissioner’s Office) that Amey did NOT declare the fatality, and did NOT declare that criminal legal proceedings were threatened or pending against them by the HSE. It was a requirement of the Public Contracts Regulations and SCC’s Pre-Qualification Questionnaire (PQQ) for Amey to declare such information. Equally, it could be perceived that SCC did not undertake adequate and effective due diligence – this is not simply about asking for the information from Amey, it is about checking that the information they provide is accurate and true. Instead, it looks like SCC adopted an ‘honesty box’ approach. Both of these things had the potential to DISQUALIFY Amey from bidding for the £2.2 billion Streets Ahead contract, something that Amey will have been fully aware of. Interestingly, an identical FOI request to Birmingham City Council has revealed that Amey also failed to disclose the very same information when bidding for a £2.7 billion highways contract with them. Omission of this information the first time (the Birmingham PFI deal) could be seen as a genuine oversight, to do so a second time (the Sheffield PFI deal) might suggest a deliberate act of deception. A further FOI request has also revealed that Amey did NOT inform SCC that they had been handed a criminal conviction by the courts for the H&S fatality mentioned above. This put Amey in breach of the Public Contracts Regulations on yet another count and also in breach of SCC’s ‘Bid Process Agreement’, which required Amey to inform SCC in writing of any change to the information in their bid. Providing false/misleading information or withholding information was again grounds for DISQUALIFICATION. The conviction was handed down by the courts just three months before Amey were due to submit their final tender. Was this (yet another) oversight by Amey, or perhaps another deliberate act of deception to avoid disqualification, this time at the final hurdle? According to correspondence from a Senior Policy Advisor at the Government’s Crown Commercial Service, if the prospective contractor was in breach of exclusion grounds at the time the contract was awarded (breach of H&S law is grounds for exclusion), and therefore should not have been awarded the contract in the first place, a specific provision exists within the Public Contract Regulations that allows for TERMINATION of contract. Furthermore, the Misrepresentation Act allows for the contract to be RESCINDED, and for the Council to SUE Amey for damages. For the avoidance of doubt here, the law has been broken. PERIOD. It is not possible to un-break the law and a FoI request to the HSE revealed that the law was broken on no less than FOUR counts: Section 2(1) and Section 3(1) of the Health & Safety at Work Act, Section 3(1) of the Management of Health & Safety at Work Regulations, and Section 6 of the Control of Substances Hazardous to Health Regulations. The Council, in a desperate attempt to deflect public and the media attention, published ‘fake news’ on their News Room webpage (scroll down to number 22), stating that it was a ‘myth’ that Amey were not complying with health and safety law, and more incredulously, claimed that the HSE had no concerns about health and safety on the contract! At best this is propaganda, at worst, downright fabrication of the truth, and probably no coincidence that it was published the day after being made public at a full Council meeting. The Leader of SCC, Cllr. Julie Dore, is on record at a previous Council meeting saying that she would be prepared to end the contract if there was a breach of H&S law. That has now happened (on four counts). Does she have the leadership qualities and strength of conviction to stand by what she said, or is she a weak and ineffectual leader who is a mere corporate puppet? 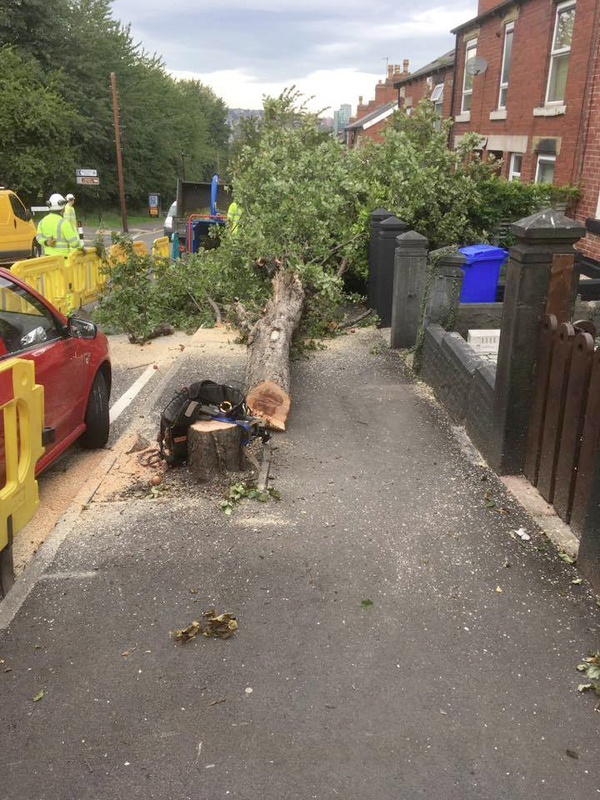 And finally, more recently a young child was hit by a piece of flying tree debris despite being a good five metres outside the designated safety zone. The matter was reported to the HSE who are currently looking into the matter. When a public question was asked at a recent Council meeting, in an attempt to distance the Council from any blowback, Cllr. Bryan Lodge claimed that any such safety matters were between Amey and the HSE. Unfortunately, SCC are at the top of the contracting chain, and any health and safety incident concerning their principal contractor (or a sub-contractor) is SCC’s problem too, as Liverpool City Council found out to their detriment in this recent example of case law. What is the Council’s threshold for the number of breaches of health and safety law that they will allow? What is their threshold for the number of children who can be injured? What we have is a Council leader who is effectively gambling. She is gambling that there will not be an incident, but if there is, she is gambling that any fine handed down by the court will be less than the contract termination penalties payable to Amey. You cannot gamble with people’s lives, and you cannot put money before public safety, especially if the legal duty is absolute. If ever there was ever a time for termination of contract for breaches of health and safety law, then that time is now. The lack of action by Cllr. Julie Dore on this matter is tantamount to condoning it. – Richard Davis is a NEBOSH qualified Health & Safety Practitioner of 15 years standing, and a member of the Institution of Occupational Safety and Health (IOSH).